Environmental stewardship and sustainability have become woven into most facility management operations to the point where sustainable operations are almost synonymous with operational excellence. However, challenges still remain to maintain facilities with climate change, severe weather events, and international unrest. As climate change adaptation planning is becoming more important and more recognized, sustainability leaders are taking a broader view of sustainability planning. With the help of 100 Resilient Cities funding, Resilience Officers are being added to sustainability offices across the country. The increasing frequency of severe weather events requires us to be able to respond and recover, linking long term sustainability and livability to business resilience planning. Facility managers and building owners need to understand what business resilience is and how to incorporate business resilience into their long-term planning efforts. #1 What business resilience means to your organization. #2 FMs play a central role in business resilience. #3 Natural disasters are not the only cause of business disruption. #4 An emergency response plan is not enough. #5 Business resilience planning doesn’t have to break the bank. business resilience [biz-nis re-zil-ee-uh ns] noun the ability to rapidly adapt and respond to business disruptions, safeguard people and assets, while maintaining continuous business operations. Business resilience is the ability to rapidly adapt and respond to business disruptions, safeguard people and assets, while maintaining continuous business operations. Business resilience planning provides guidance for ensuring the ability of personnel to respond, resume, and restore to a pre-determined level of operation following a disruption. The facility management business resilience bottom line is to enable your customer to continue their mission. Business resilience planning could make or break your organization. Start with what business resilience means to your organization. What is the mission and vision of your organization? Who are your customers? It is important to determine how much you can bend before you break. Some parts of daily operations in your organization are more flexible than others. There are a lot of moving parts in your organization. When it breaks down, which areas need the oil first? Business resilience planning relies on identifying essential functions and prioritizing what is critical to be performed in times of distress. Resilient organizations have secured their mission-critical and time-sensitive business functions because they are the least flexible. Just as it is important to know which functions, resources and personnel are needed to keep you in business, it is important to know what can push you out of business as well. Effective business resilience planning includes establishing an acceptable minimum level of operations. A critical step in becoming a resilient organization is understanding what your vulnerabilities are so that you can prepare to stay in business. FMs, as you well know, are trying to keep up with competing priorities, evolving technology, and the drive for corporate social responsibility. What is your purpose as an FM in your organization? Is it creating and maintaining an environment that will enable your organization to fulfill its mission? Business resilience may not be written in your job description, but it is likely part of your job and on your mind, even if you don’t know it yet. There is a lot at risk without business resilience planning. People’s livelihood, careers, and safety are at stake. The upside is that it gives everyone a reason to get involved and play their part in business resilience. Everyone from every corner of the organization plays a role in business resilience and has something to benefit from the continuity of business-as-usual. FMs play a part at every stage of business resilience in creating and maintaining operational plans, budgets, trainings, drills, etc. You enable your customer to continue their mission. It is to your advantage to adopt a long-term view of business operations and investments. The facility manager plays a unique role in business resilience, specifically in helping the organization create workplace environments that aid the mission and help the business continue in the case of disruptive events. The facility management team can become facilitators of the business resilience process by preparing the facilities and the workforce with the right amount of preparation, resources and processes to reestablish business-as-usual as quickly and safely as possible. Though naturally-occurring and weather-related events are something to highlight, there are other disruptions that need to be addressed. 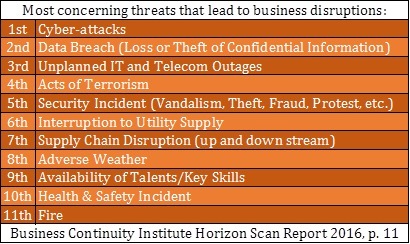 To know best which threats your organization is most susceptible to it is important to understand the criticality of individual operations in your organization. Prioritizing business functions through a formal risk assessment can lead to a smooth understanding of risk at large and paints a better picture of what it will take to become more resilient. A risk assessment identifies and analyzes business risks and associated threats. The objective is to understand the effectiveness of existing risk controls and identify additional risk treatments to decrease the likelihood or severity of disruptions to the organization’s essential business functions. Going through a formal risk assessment process can be a very effective way to prioritize your business resilience planning efforts. Most facilities groups are familiar with emergency preparedness and many probably have some documentation on site as far as what to do in case of an emergency. But, are you truly ready to efficiently resume business after an emergency or a major disruption? Let’s take an example. It’s 4:00pm on a typical Tuesday. A section of seemingly sturdy roof atop the 8th floor caved in due to heavy snow and ice accumulation and is now leaking water into the server room. Local authorities have been notified and have ordered an immediate evacuation of the entire building. Your designated emergency team begins an orderly evacuation per your documented evacuation procedures. Everyone is gathered at the designated offsite gathering place just as planned. Roll call is taken and, to your relief, everyone is safely out of the building and accounted for. The Fire Marshal indicates the building is closed indefinitely due to reasons beyond your control. You can’t retrieve any items for a few days and a full re-occupation date of the building is unknown at this time. Now what? Do you have a plan in place to continue business? You won’t be the only one asking this question—so will your 450 employees, and your customers. Every organization has a different structure and culture and creative, innovative solutions should be utilized to meet the needs of foreseen and unforeseen business disruptions. How long can you afford to be down? Although the probability of a major disruption may be low, the impact of disruptions—even minor—can be significant on profit and productivity. Without business resilience planning, recovery will take longer and be costlier. Think about what one hour of downtime means for your organization. An hour of downtime can be costly to an organization of any size, but the impact of the hour of downtime is extended into the future as it can take much more time to resume business-as-usual and to fully recover. The statistics are daunting. According to FEMA, disasters typically claim 40% of small businesses. 1 in 4 small and medium sized businesses hit by a major storm do not reopen and small businesses lose an average of $3,000 a day after closing due to a major storm. Effective planning can decrease our risks of these casualties and planning doesn’t have to break the bank. Few costs are typically needed to establish an effective business resilience plan. The costs of planning are typically measured in man-hours and are far outweighed by the opportunity costs of not planning. Significant costs are most common with failing physical infrastructure or IT needs and are less-common. When needed, consultants can provide necessary expertise and help streamline efforts to maximize benefits and keep a consistent vision. Careful business resilience planning can mitigate the impacts of a disruption and allow your business to continue to function or to return to normal more quickly. In addition, effective business continuity planning has the potential to improve overall performance and minimize corporate risk. Perhaps the most important effect is the ability for the Facility Manager to enable its customer to continue its mission. Show your value and your commitment to the organization by advocating for business resilience. Show your customers the confidence that your service is dependable and can be relied upon at all times. When you take into account all of these important positive impacts, business resilience planning can have a positive financial impact as it decreases the potential negative productivity and financial impact that a disruptive event can have. Although the threats may have a low probability, through business resilience planning efforts, you can identify what the impacts of those threats are and put a plan in place to reduce those impacts. If you consider the potential financial impact of damage to your reputation, the return on investment in business resilience planning is almost immediate. Part Two of this article, on operationalizing resilience in facilities. Click here to go to it. Maureen K. Roskoski, CFM, SFP, LEED AP O+M is the Business Continuity Lead and Corporate Sustainability Officer at Facility Engineering Associates, P.C (FEA). With extensive experience in all things sustainability, Maureen leads FEA’s business resilience practice area. She is our internal Business Continuity Lead and helped FEA adopt business resilience as part of the company culture as we achieved ISO 22301 certification at FEA’s corporate office. As an experienced presenter and instructor she teaches numerous IFMA and BOC courses and presents on all things FM, sustainability and business resilience. Stephen Clawson is a Staff Professional at Facility Engineering Associates, P.C (FEA). He is a recent graduate of Brigham Young University where he majored in Construction and Facilities Management. Stephen has always had a curiosity and respect for the built environment. His experience at FEA has exposed him to top shelf thinking and high-performance FM principles, and has broadened his perspective of the FM industry to include business resilience which has reinforced his appreciation for the built environment.